If you are using the NASA Explorer Schools featured lesson Engineering Design: Forces and Motion — Balloon Aerodynamics Challenge, you may extend the lesson’s relevancy by introducing your students to NASA’s Super-TIGER balloon. 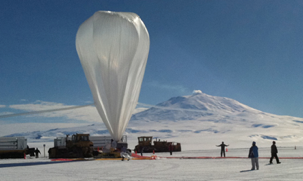 Flying high over Antarctica, a long-duration balloon has broken the record for longest flight by a balloon of its size. The record-breaking balloon, carrying the Super Trans-Iron Galactic Element Recorder — or Super-TIGER — experiment, has been afloat for 46 days and is on its third orbit around the South Pole. This feat is an outstanding achievement for NASA’s Astrophysics balloon team. Keeping these huge balloons aloft for such long periods lets NASA do “forefront” science that would be difficult to do otherwise. To read more about this record-setting flight, visit https://www.nasa.gov/centers/wallops/news/supertiger-record.html. You can find Engineering Design: Forces and Motion — Balloon Aerodynamics Challenge on the NES Virtual Campus.